Thank you for your time and effort completing the recent computer survey on survey monkey regarding safety checklists prior to regional anaesthesia. The survey was sent to all Anaesthetists and trainees at Gold Coast University Hospital and Private Anaesthetists via GCape. 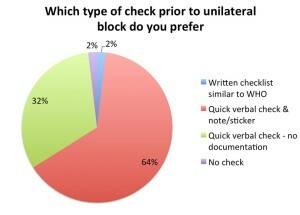 The purpose of the survey was to gauge how common wrong sided blocks are (given they are believed to be under reported) and also to gauge opinion around the introduction of the “Stop before you block” checklist. There were 54 responses, the majority of which were consultants (38 or 70%), with 4 fellows, 6 advanced trainees and 6 basic trainees. 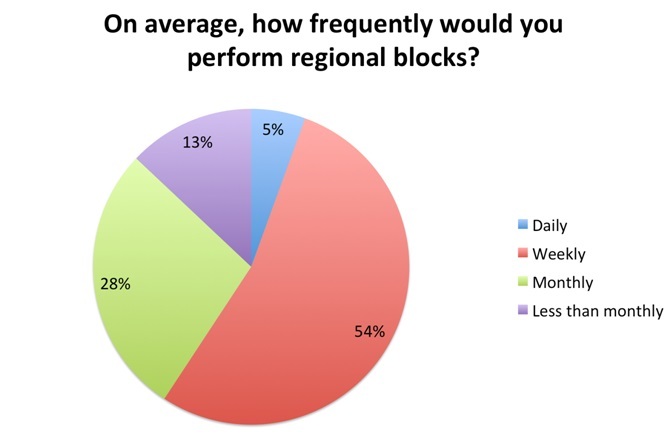 There was a variety of level of experience with blocks with the majority reporting they perform blocks weekly. 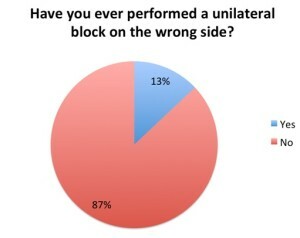 There were 7 respondents that reported they had performed a wrong sided block (13% of respondents). 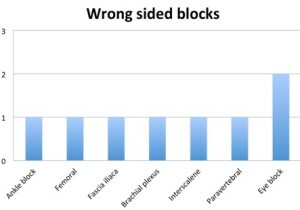 The wrong sided blocks were a range of different types (eye blocks, shoulder, paravertebral, femoral and ankle blocks). There was no real relationship with wrong-sided blocks and being awake (2), sedated (3) or asleep (2). 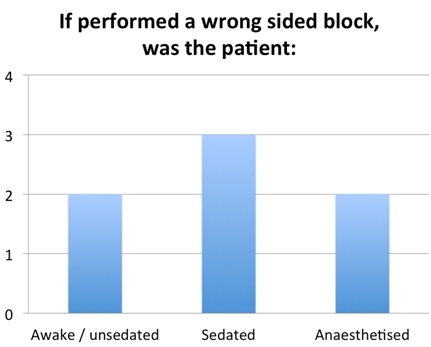 This is similar to other surveys with a survey from the UK reporting that 40% of wrong-sided blocks were performed on patients that were awake, so having an awake patient does not prevent against wrong-sided block. There were also 7 respondents that reported “near misses” where they had been stopped from performing a wrong-sided block, 6 by the anaesthetic nurse. 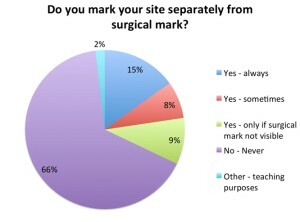 The majority of anaesthetists never mark the site of their block (66%). To the question of should a site check be performed the majority (94%) said yes, with 92% in favour of one just prior to needle insertion. Of the replies, the majority (96%) preferred a quick verbal check and 64% would document it in the anaesthetic record. So in summary the survey had a good response from consultants with varying experience with blocks. 7 had performed a wrong-sided block with a further 7 near misses. 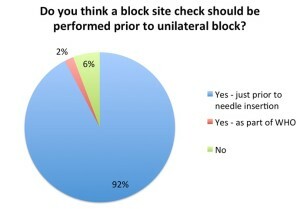 The majority were in favour of performing a site check, with a quick verbal check preferred. Note: The November workshop is now full, however you can register your interest for workshops in 2015. Dr Helen Crilly will be running a College recognised Anaphylaxis Workshop at John Flynn on Saturday morning 1st November 2014. Helen, the ANZAAG Coordinator, ran a workshop at the recent ASA NSC however it was quickly booked out. To satisfy demand for an encore, Helen has graciously agreed to repeat the workshop, giving local Anaesthetists the opportunity to attend at no cost. You are able to claim this course as an “Emergency Response” activity in your college CPD. If you were on your toes and attended the CICO activity earlier this year you could attend Helen’s workshop and satisfy all your emergency response requirements for the triennium before the end of the first year, all for free! Registration is now open at the GCAPE Anaphylaxis page.